VMware Confidential V M W A R E V C L O U D A I R N E T W O R K P R O G R A M P R O D U C T U S A G E G U I D E / 4 Summary The following products have been added to the VMware vCloud Air Network Program: 1. VMware NSX Enterprise 2. VMware NSX Advanced for Desktop 3. VMware NSX Enterprise for Desktop 4. VMware vCloud SP Bundle Standard with Management 5. VMware vCloud SP Bundle Standard with Networking 6. VMware vCloud SP Bundle Advanced 7. VMware vCloud SP Bundle Advanced with Management 8. VMware vCloud SP Bundle Advanced with Networking 9. 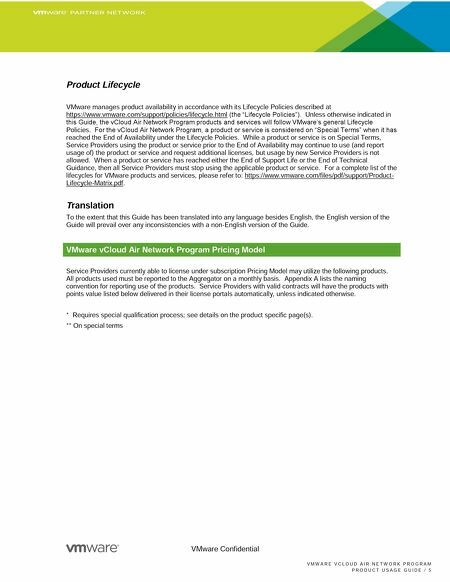 VMware vCloud SP Bundle Advanced with Networking and Management The following products have been updated in the VMware vCloud Air Network Program: 1. Updated VMware vRealize Business for Cloud Advanced to be a standalone product used in conjunction with the new vCAN bundles at 2 points/ GB Reserved RAM.Updated The following products are placed on "Special Terms 1 " in the vCloud Air Network Program: The products on "Special Terms" are expected to be removed from the vCAN program by the end of Q3 2016 or when their transition products are generally available in the vCloud Air Network program, whichever is latter. Meanwhile, they are available for use only by vCAN partners with contracts completed prior to June 28, 2016. The new vCAN partners with contracts completed on or after June 28, 2016 should use the recommended migration option where applicable. 1. VMware NSX-V. Its recommended migration option is VMware NSX Enterprise at same point value. 2. VMware NSX-MH. There is no recommended migration path for it currently. 3. VMware vCloud SP Bundle Premier. Its recommended migration path is VMware vCloud SP Bundle Standard with Networking or VMware vCloud SP Advanced Bundle or Vmware vCloud SP Advanced with Networking. 4. VMware vCloud SP Bundle Premier Plus. Its recommended migration path is VMware vCloud SP Bundle Standard with Management or VMware vCloud SP Bundle Advanced with Management. 5. VMware vCloud SP Bundle Premier-X. There are four recomended migration paths: VMware vCloud SP Bundle Standard with Networking, VMware vCloud SP Bundle Advanced with Networking, VMware vCloud SP Bundle Advanced with Management or VMware vCloud SP Bundle Advanced with Networking and Management. 6. VMware vCloud SP Bundle Premier- X Plus. Its recommended migration path is VMware vCloud SP Bundle Advanced with Networking and Management. 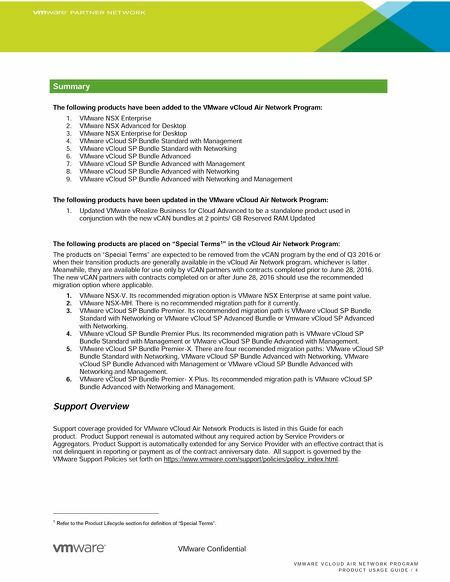 Support Overview Support coverage provided for VMware vCloud Air Network Products is listed in this Guide for each product. Product Support renewal is automated without any required action by Service Providers or Aggregators. Product Support is automatically extended for any Service Provider with an effective contract that is not delinquent in reporting or payment as of the contract anniversary date. All support is governed by the VMware Support Policies set forth on https://www.vmware.com/support/policies/policy_index.html. 1 Refer to the Product Lifecycle section for definition of "Special Terms".